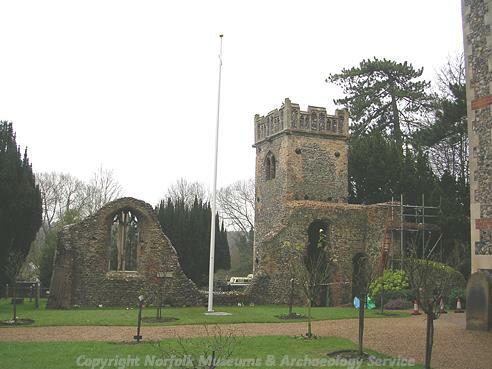 The 16th century south tower porch of the original St Andrew's Church survives, and it is through this that visitors pass into the new church, which was designed by Thomas Jekyll in 1866. 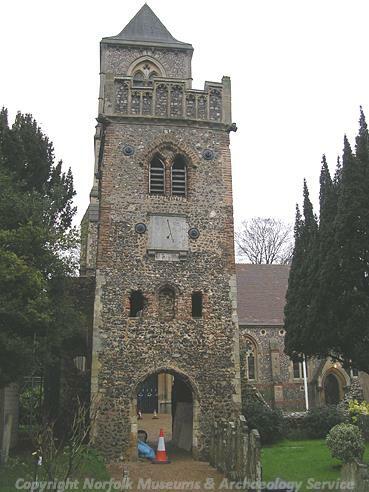 The building itself is of knapped flint, red brick and stone, and has a nave and south aisle, apse and a tower added in 1881. Inside, the 14th or 15th century font survives. Ruins of old church - nave, chancel and porch-tower; all of late 15th/16th century date. 14th-15th century font, hatchment in new church. 'New' church by Thomas Jekyll 1866, tower 1881, spire removed 1954. See report (S2) and press cutting (S3) in file. Compiled by E. Rose (NAU), 28 August 1987. --- Newspaper Article: Eastern Daily Press. 1989. Picture of spire before Hitler's explosives demolished it.. 15 August. --- Newspaper Article: Eastern Daily Press. 1993. 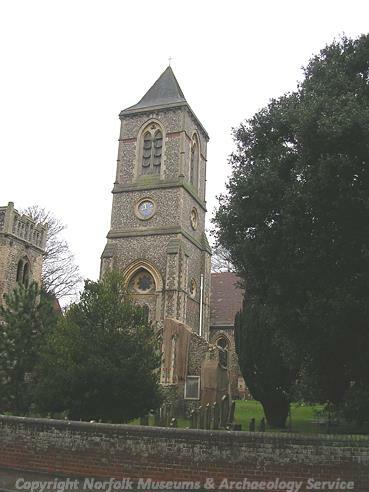 Thorpe St. Andrew parish church - picture.. 19 February. --- Newspaper Article: Eastern Daily Press. 1997. 'Richmond of Norfolk' looking like a model village.. 6 August. --- Newspaper Article: Eastern Daily Press. 1998. St. Andrews Church, Thorpe - picture.. 9 January. <S2> Unpublished document: Rose, E.. 1987. Building Report..
<S3> Newspaper Article: Eastern Daily Press. 1982. Danger forces closure of Thorpe ruins.. 21 October.